These handmade mother and baby quail figures will enliven your yard, garden, or window box. Make this adorable flock your own—and add a few feathered characters to your favorite space! 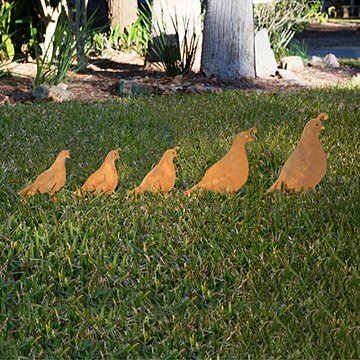 Gardens, lawns, porches, and window boxes will all look a little brighter in the presence of these playful bronze quail families, handmade by Arizona-based artist Chris Crooks. Each unique, individually cut figure features its own stake so the group may be arranged however you please; from a distance, visitors might even mistake them for a real mother bird and her brood! Visit our blog to go behind the scenes with Chris Crooks! Due to the handmade nature of this item, some variance is to be expected. Rust patina will darken with age. Comes as a set of five. Great yard ornament. Our development is called "Quailwood" so it was perfect! It suits my purpose perfectly. They stand out in front of the bricks below the wrought iron fence surrounding my pool. The quail family is really cute and adds charm to a garden. Love my set of quail! The quail were very easy to install along the rail. All I had to do was drill a small hole in place them in. All I can say is, "I love them!". Put the quails up the day I received them and love looking at them from my kitchen window. They look so natural. I gave this to my mom and she loves it. It's in her backyard and easily visible from the house. I was looking for nice addition to my front garden and this family of Quail's caught my eye! They are perfect for my garden! Loved that it was bronze. My mother placed them in her yard visible from the outdoor seating. A very loved gift for the birdwatcher mom I have! My mom loves birds of all kinds. She also loves yard decor that show her passion for the outdoors. I purchased these as gifts. After receiving them I may purchase for myself as well.